The trial is the thing. As readers of this blog know, the London-based Human Rights organization, Interights, on behalf of Judge-Magistrate Baltasar Garzón, has filed a suit with the European Court of Human Rights, against Spain’s Supreme Court, over the Supreme Court’s handling of charges of malfeasance (“prevaricación”) leveled against Judge Garzón by the extreme right-wing fringe group, Manos Limpias, and by the heirs of the Spanish fascist party, La Falange. These groups accused Garzón of malfeasance for initiating an investigation into the crimes against humanity committed by the Franco regime during the Spanish Civil War and in its aftermath. Despite the reiterated opposition of Spain’s Prosecutor General, the Supreme Court has forged ahead with the case, and Garzón has been suspended without pay for about a year now. Normally, appeals to the European court in Strasbourg can be made only after all national legal channels have been exhausted. In the instance of Garzón’s case, that would mean awaiting a trial and verdict from the Supreme Court, and, if necessary, also awaiting the decision on an appeal that would be made to the Constitutional Court. Both of these courts have amply shown in recent years that they can sit on cases for months and even years, making it clear that, regardless of the merits of this particular case or its eventual outcome, the Judges on the Supreme Court and the Constitutional Court can keep Garzón away from his position at the Audiencia Nacional for as long as they see fit. For this reason, it would seem, Interights has taken the novel step of filing the suit at this stage, rather than at the end of the judicial process in Spain. The argument being made by Interights is fascinating and compelling: the violation of Judge Garzón’s rights is independent from any ultimate verdict that might be rendered in the Spanish courts. The violation has been, and is being, committed in the prosecution itself, which is depicted as an offense against judicial independence, with tangible harmful consequences for both Garzón (loss of income and livelihood, for example), and for the plaintiffs who, in the first place, asked Garzón to investigate Francoist crimes. Indeed, this argument seems powerful and coherent, given the lengthy list of bizarre twists and turns that have characterized this case from the start. 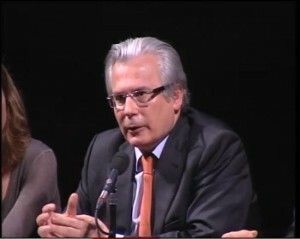 At bottom, Interights seems to be asking the question: Is it possible that, in a given set of circumstances such as those surrounding the prosecution of Garzón, a Court of Law might have as its objective not so much the establishment of guilt or innocence, but rather the maintenance of a punitive state of limbo for Judge Garzón? What are some of those bizarre twists and turns that would seem at least to lend credence to this frightening possibility? As already mentioned, originally, the accusers in this case were the extreme right-wing fringe group, Manos Limpias, and the Spanish fascist party, Falange. Falange was eventually excluded from the accusation, in a very murky move by the presiding judge (see below). The accusers, who were not negatively affected by Judge Garzón’s decisions, are allowed to act as “Popular Accusers,” an anomalous figure in Spanish law that enables unharmed third parties to formulate accusations on behalf of the well-being of the commonwealth. Ironically, the Prosecutor General of the Spanish state, whose specific mandate is to uphold the country’s laws and the integrity of its judicial system, opposes the prosecution of Judge Garzón in this case. Is it possible that, in a given set of circumstances, a court of law might choose to make use of the anomalous figure of the “popular accuser” in order to discipline, chastise or humiliate a judge who has demonstrated “excessive” independence? Once a sitting judge has been put on trial officially, temporary suspension from the bench is an automatic measure undertaken by the governing body of the Spanish judiciary (Consejo General del Poder Judicial, or CGPJ). Before Garzón’s trial was declared open, and while several motions and resolutions were still pending before the trial could begin, Judge Garzón requested a leave of absence from the Audiencia Nacional to take up a provisional position at the International Criminal Court in the Hague. The granting of this leave of absence –which was supported by all relevant parties– would have obviated the need to suspend Garzón, since he would have voluntarily been abandoning his responsibilities at the Audiencia Nacional. But to the astonishment of all observers, the presiding judge, Luciano Varela, with unprecedented haste and in less than twenty-four hours, resolved all the outstanding motions and declared the trial open. This haste, which had absolutely no beneficial effects for the proper administration of justice, and which to many seemed vindictive, made the suspension of Judge Garzón inevitable. When the time came for the accusers –Manos Limpias and the Spanish fascist party, Falange—to submit to the Court in writing their formal accusations, a number of extremely unusual things transpired. Judge Varela informed the accusers that the first drafts of their accusations were inadmissible. But rather than dismiss the charges –which was his prerogative at this point, absent an accusation from the state Prosecutor– he gave the “popular accusers” 48 hours and very specific instructions on what to include and what to omit so as to make the documents admissible. Varela eventually admitted the accusation of Manos Limpias, but excluded Falange, because they had not adhered to his conditions. For many observers, the “coaching” of the accusers by the presiding judge seemed to be clear evidence of a “the-trial-must-go-on” attitude. (How many cases are dismissed because of defectively formulated accusations, particularly in instances in which the accusers are un-harmed third parties?) And to many, the exclusion, on technical grounds, of Falange from the trial seemed like a public-relations move on the part of the court –indeed, the international press had been baffled by the sight of a prestigious judge in a democratic Spain being put on trial by, among others, a Fascist organization. In the midst of this swirling international controversy, Spain’s Supreme Court made the totally unprecedented and bizarre move of announcing a press conference in which it promised to explain publicly the intricacies of Spanish law in the context of the Garzón case. The Court first invited only the international press, then, after some grumbling, the domestic press was invited as well. Finally, alleging that the Court had been overwhelmed by the amount of journalists wanting to attend the session, the conference was cancelled. Thank you for providing such an excellent, clear breakdown and analysis of this complex case. No matter how clear the editors’ breakdown is, the case itself is murky at its core. This editorial serves as clear proof that the flaws in the Spanish judicial system are being used by its own members to subvert justice. The fact that Spain’s Chief Prosecutor and the rest of Europe (and the Americas) seem united in Garzón’s support makes this case an embarrassment to Spain, and one hopes that when the case is resolved, the judges involvled will be impeached on much more justified grounds than those presented against Garzón..
I’m wondering which human rights specifically of Garzon are violated? Art. 6? It seems to me that this is not so clear in the petition of INTERIGHTS. Furthermore, do you think the case will be admissible, since there has been no judgment yet before the Supreme Court? All the argument he raises before the ECHR, he can probably also raise before the Supreme Court. Si hay una lección en toda esta mojiganga garzonesca, es ésta: si los jueces españoles se encabronan contigo, ¡pobre de tí! Parece que para ellos, la “independencia judicial” significa hacer lo que se les antoje con impunidad. ¿admitir a trámite tres causas estrafalarias para aniqilar a un colega que ha pasado la raya? Hecho. Ayudar a los acusación para que sus escritos peguen? Ya está. Exigir testimonio de los jefes de cinco o seis empresas cuando la acusación tiene como enfoque único el Banco Santander? A sus órdenes. Afirmar tajantemente que no se conoce ningún caso –ni por referencia– donde se pinchan conversaciones entre presos y abogados, cuando hay tres casos conocidísimos por cualquier lector de la prensa? ¡Marchando! Si éste es el trato que, gracias a la independencia judicial, se le da a un Juez como Garzón, admirado y mirado por todo el mundo, ¿qué no harán con el pobre diablo desconocido que se encuentra en el Guantánamo de autos y encajes que parece ser la independencia judicial en España. Thanks, that was very well laid out. Disgraces like this prevail all round the Spanish institutions, eventually pushing some of us to leave a country we love.